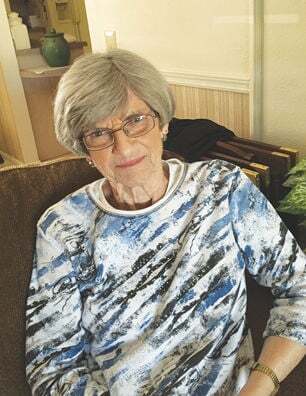 Pictured is 1955 CHS graduate Janice (Fowler) Davison, who had her first book “A Killer Among Us” published at age 82. Janice A. Fowler Davison is 82 years young! It was only five years ago that she decided to take an online novel writing class that eventually evolved into having her first book, “A Killer Among Us,” self-published earlier this year. The thriller centers around Arizona State University, its football team, cheerleaders, faculty and community. Not only does the mystery focus on suspense and sleuthing, but also on one’s Christian faith being lived out on a daily basis. What a great example Davison is for growing older gracefully and creatively. Talk about your Chariton roots. JD: I grew up seven miles north of Chariton in Whitebreast. From kindergarten through 8th grade, I attended country school right on our farm property. I then attended Chariton High School, graduating in 1955, and then marrying my high school sweetheart John Davison on Christmas day of the same year. We were too young but stayed married for 57 years. My brother Jim owned a DX filling station in Chariton on the NW corner of the square. My brother Norman worked for Jim before moving to Florida. My brother Glen worked at the telephone company and obtained work for me as a telephone operator during my high school years. I remember the great 4th of July celebrations. My mom lived over the ISU office on the square, so we had front row seats for the festivities. The first HyVee store came in while I was living there. I still have friends in Chariton. My sister-in-law Evelyn Fowler enjoys promoting my book. What does your life look like presently? JD: Well, my husband, who greatly encouraged me in my writing, died in 2012. However, my sister Barbara who is 87 lives close by, and our one daughter Cristi and her husband moved in across from my home six or seven months ago. I keep busy working at the First Christian Church two days a week in their office. Up until 2011 when I was injured, I used to enjoy golfing and bowling. Now I get my exercise walking my shih tzu Sparky. How does your Christian faith permeate your book? JD: The old Whitebreast Church re-opened right across from our farm, so it was very convenient to attend. It was during revival meetings there that I asked Christ into my life at the age of eight. When writing my book I didn’t want to just create a mystery but wanted to inspire others and touch someone’s heart spiritually more than any monetary gain. Many Bible verses are woven through the chapters to encourage the main characters and ultimately the reader. Read the April 11, 2019 edition of the Chariton Herald-Patriot for the rest of the story.